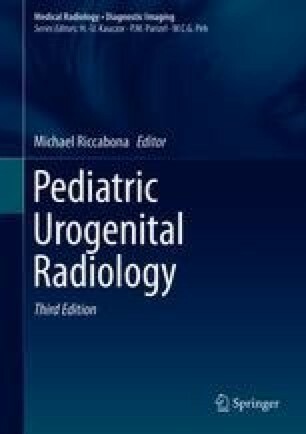 Congenital anomalies of the kidney and urinary tract (CAKUT) cover a wide range of structural malformations that result from defects in the morphogenesis of the kidney and/or urinary tract (see also chapter “Congenital Anomalies of the Renal Pelvis and Ureter”). CAKUT occur in approximately 1:500 live-born fetuses and are the most common cause of chronic kidney disease in children worldwide (Renkema et al. 2011; Vivante et al. 2014). Congenital anomalies of the kidney include renal agenesis, renal hypo-/dysplasia with or without cysts, and multicystic dysplastic kidneys (Weber 2012). While most CAKUT cases are sporadic, renal abnormalities are found in close relatives in approximately 10 % of cases (Winyard and Chitty 2008). Although CAKUT typically occur as isolated malformations, they occasionally develop in association with additional congenital anomalies outside the urinary tract, such as in the renal coloboma syndrome or the renal cysts and diabetes syndrome; they may also be associated with cardiac malformations. Currently, more than 20 monogenic CAKUT-causing genes have been identified, and recent findings suggest that CAKUT may arise from a multitude of different single-gene causes (Vivante et al. 2014). The malformation phenotypes vary from normally appearing kidneys with preserved renal function (i.e., incomplete penetrance) to severe hypo-/dysplasia and end-stage renal disease. Features linked to worse prognosis are (1) bilateral disease, (2) decreased functional mass (which encompasses not just small kidneys but also large ones where cysts replace normal architecture), (3) lower urinary tract obstruction, and (4) anhydramnios or severe oligohydramnios (Winyard and Chitty 2008). Current management of CAKUT includes observation, surgical interventions, prophylaxis and treatment of urinary tract infections, strict blood pressure control, supplements for renal support, and nephroprotective treatment to slower the progression of chronic kidney disease.